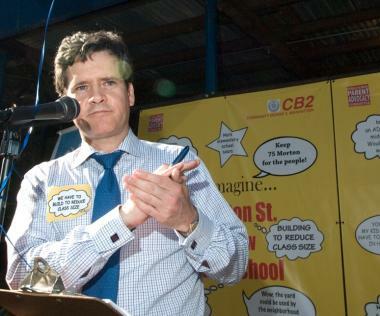 Brad Hoylman, who filed paperwork April 30, 2012 for a City Council run, spoke at a rally in 2009 for a public school at 75 Morton St. The city announced in March 2012 that it will buy the building to open the school. MANHATTAN — Community Board 2 chair Brad Hoylman has taken a first step toward making a run for Speaker Christine Quinn's City Council seat in the 2013 city election, opening a campaign account on Monday, state Board of Elections records show. In the filing, Hoylman, who was widely expected to run for the District 3 seat, representing the Village, Hudson Square, Chelsea, Hell's Kitchen and Midtown, specified for the first time that he will run for that office, which presumptive mayoral candidate Quinn will vacate at the end of her current term. Hoylman, a 46-year-old nonprofit lawyer and father who studied at Harvard Law School and Oxford University, called the filing a "preliminary" step and pointed to his record as CB2 chair and Democratic District Leader for Greenwich Village. Community Board 2 chair Brad Hoylman, who appears here with Council Woman Margaret Chin, will run for a City Council seat, according to paperwork filed with the state April 30, 2012. "I'm in my third term as chair of Community Board 2, where I think I have a long, strong record of results," he said in a statement. "I've helped secure two new public schools for the district (an elementary school on 17th Street and most recently, a new middle school at 75 Morton St.), fought NYU's irresponsible campus expansion plan, established a legal defense fund for rent-stabilized tenants … and brokered a deal to renovate Washington Square Park," he said. 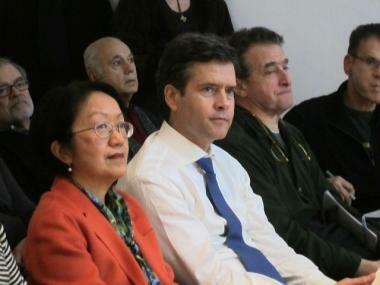 "I'm passionate about progressive causes such as workers' rights, senior issues and tenants rights," Hoylman continued. The City Council run will be Hoylman's second. He ran to represent District 1, which covers Lower Manhattan and Governors Island, in 2001, but lost to Alan Gerson. Village resident Rich Caccappolo, who has worked with Hoylman on neighborhood issues as a CB 2 member, said he has been consistently impressed with Hoylman's leadership and desire to listen to locals. "I think [Hoylman] is a tremendously talented civic leader," he said. "I'm sure he'll be a tremendous council member." West Village resident Susanna Aaron, a CB2 member, said she looked forward to Hoylman's campaign and thought he would make a good councilman. "He deserves a bigger role in city government or, rather, we all deserve to have him there," she said. "He is thoughtful, fair, brilliant and delightfully funny, and he did a terrific job for Greenwich Village as CB2 evaluated the Rudin and NYU development proposals." State Democratic Committee Member Arthur Schwartz, who rivaled Hoylman for the District Leader seat in 2005 and said he hopes to succeed him in the position, praised Hoylman's progressive politics and envisioned him playing "a mediator role" as a councilman. "One of the things that has held him back is a desire to keep lots of people happy," he said about Hoylman as CB2 chair. As a councilman, he could come into his own, Schwartz said. "He might be able to be someone with stronger positions [as a Councilman] than he's been as community board chair." Hoylman's expected competitors — all of whom, like Hoylman, self-identify as LGBT — are Village hospital advocate Yetta Kurland, Community Board 4 chair Corey Johnson and Greenwich Village Society for Historic Preservation executive director Andrew Berman. Johnson has filed state paperwork for the Council seat, Kurland has filed state paperwork but not yet declared the office for which she will run and Berman has not yet filed city or state paperwork or confirmed that he will run.